Scapulothoracic bursitis, also known as “snapping scapula syndrome”, develops when there is a problem with how the shoulder blade moves over the rib cage. Inflammation of one of the two scapulothoracic bursae, that sit between the scapula bone and the subscapularis muscle, affects how the shoulder blade (scapula) moves causing friction, weakness and pain. It causes a constant, dull ache around the shoulder blade and sufferers often complain of a “snapping” or “grinding” sensation when they move their arm. Scapulothoracic bursitis is a rare condition, most commonly affecting young athletes who do lots of overhead action such as throwing or swimming. However previous shoulder problems such as ligament tears and arthritis also increase the risk of developing scapulothoracic bursitis. Here we will look at the common causes, symptoms, diagnosis and treatment options for snapping scapula syndrome. All around our bodies, there are numerous bursa. These are small fluid filled sacs that act as cushions, providing lubrication between tendons and bones, allowing smooth, friction-free movement. The subscapularis muscle is a large muscle that sits between the shoulder blade and the rib cage. 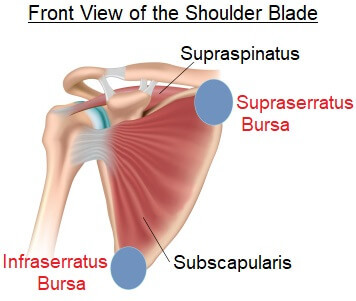 There are two bursa (known as infraserratus and supraserratus) that sit between the muscle and the bone allowing the shoulder blade to glide over the chest wall freely as the arm moves. One is located at the top of the shoulder blade, the other at the bottom. A large proportion of shoulder movement comes from the shoulder blade so it is really important it can move smoothly and freely. Weakness in the shoulder blade muscles leads to subtle changes in the angle of the shoulder blade which affects how it moves. It may then start to rub against the rib cage which leads to inflammation of the subscapular bursa and surrounding tissues. Your doctor will usually be able diagnose scapulothoracic bursitis by talking to you about your symptoms and observing your shoulder and scapula movements. In some cases they may do an x-ray, MRI or CT scan. Avoiding aggravating activities and movements helps reduce the friction and pressure on the bursa. 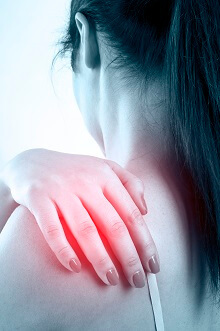 However, it is important to keep the shoulder moving within pain limits to prevent it from stiffening up. Non-steroidal anti-inflammatory medication such as ibuprofen can help to reduce pain and inflammation. Always check with your doctor before taking any medication. Working on a rehab programme with a physical therapist will help to restore normal shoulder blade movement. This will include strengthening exercises for the muscles that move and control the shoulder blade. If there are other problems affecting how the shoulder joint moves, they will be addressed too which may include stretches and further strengthening exercises for the rotator cuff muscles. You will need to work on your home exercise programme daily for a number of weeks. Your physical therapist will also be able to advise you about correct posture. In some cases your doctor may offer you a steroid injection to help to reduce the pain and inflammation from scapulothoracic bursitis. A mixture or cortisone and local anaesthetic is injected in to the bursa. It usually gives good relief of symptoms and it also confirms diagnosis, as an improvement of symptoms confirms that the symptoms were coming from the bursa. Injections should not be used in isolation though. Whilst they help to reduce the pain and inflammation, if the underlying cause of scapulothoracic bursitis is not addresses, symptoms will most likely return. You can find out more about how injections work and the potential risks on our sister site. Many people find that using either a cold pack or a heat pack over the shoulder blade helps to reduce their pain. You can use a simple method e.g. a bag of frozen peas wrapped in a towel or a hot water bottle with a fluffy cover, or a specially designed shoulder wrap. Heat or ice should only be used for 10 minutes at a time and you should wait 2 hours between applications. If symptoms of scapulothoracic bursitis have failed to settle with non-operative treatment you may be advised to have surgery. 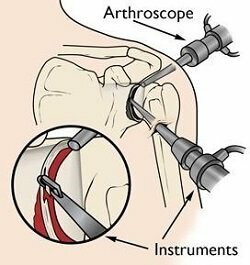 Following surgery your arm will most likely be immobilised in a sling for up to four weeks to allow the shoulder to heal. A physical therapist will work on a graded rehab programme with you starting with passive exercises (where the weight of the arm is supported) to keep the shoulder moving well. After approximately four weeks you will progress to more active range of motion exercises and should be able to do most of your normal daily activities. Strengthening and resistance exercises are usually introduced after around twelve weeks. Most people make an excellent recovery from scapulothoracic bursitis surgery and return to all their usual activities within four months.